Hello everyone! �I am taking another walk down memory lane today. 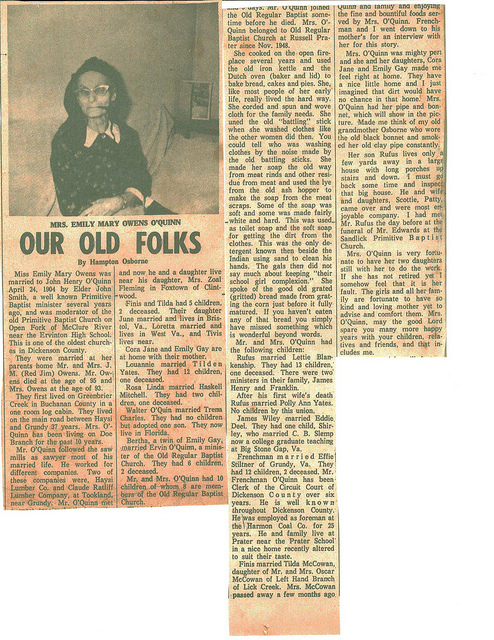 �I remembered this morning (before I even got out of bed) that I had this old newspaper article about my mom’s mother. �It took me �a while to find it but it was worth the search. �The newspaper was dated 1966 and I think the writing style is so sweet. �I apologize that I couldn’t get the print to be any bigger and where the paper was folded they are a few lines missing but hopefully you will be able to read it. �I also found this sale ad from a local supermarket in the paper. �I think you will find the prices interesting. Not much going on here. �We cut wood on Saturday as it was fairly warm here. �It is a full days work when we get wood. �George cuts it, the girls and I wheelbarrow it to the truck and stack it. �We then bring it home, split it as we unload it , then stack it in the building. �As I said it is a full day but then that load is completely finished. �I like that. Hello everyone! 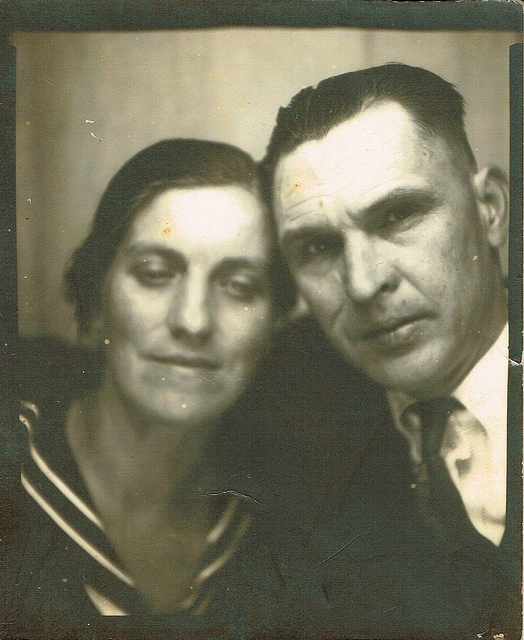 �I wanted to share with you all this picture of my grandparents. �I only yesterday came into possession of this picture. �My cousin found it with some of her pictures and sent it to me. �I have no idea when it was taken but they look fairly young to me. I was flooded with memories as soon as I look at the picture. �So many years have passed since I had seen a picture of them. �I thought maybe I would share a few of these memories. �My Maw was one of the nicest women anyone could meet. �She always had a smile for us grandkids-you know the kind that makes you think you are SO special. �She was an excellent cook and could make the BEST biscuits you would ever taste. � She became sick with cancer when I was about 8. �We lived fairly close to them so we would go visit often. �Every time we went I always wanted something to eat. �Once after she had gotten sick we were going to visit. �Mom fixed supper before we left because she said Maw wasn’t doing too well. �She told me “Now you have just eat so I know you are not hungry. �Don’t you ask Maw for something to eat. �If you do, I’m going to whip you. (Yes, I grew up during the time when kids did get spanked) �Maw ain’t able to cook nothing.” �Okay, so we go over to visit. �We are sitting on the front porch. �Maw is on the porch swing. �I am thinking I sure would like something to eat. �So in true child fashion I say, “Maw, I would ask for something to eat but Mom said if I did she would whip me!” �I can still see her getting up from the swing, giving my mom a look and saying, “Rosie, this child is hungry”. �She walked in the kitchen with me, gave me a biscuit, hugged my neck and back out on the porch we went. �Now, you know I wasn’t really hungry. �I just needed to know that everything was alright with my Maw. �And to me, that day, �it was. Now a memory I have of Paw. �My paw died of black lung. �It is a hard death. �When he was in the hospital right before he died, there was a young man in the bed next to him. �I remember Paw telling him about Jesus and how he needed to turn his life over to Him. �I listened carefully. �A few days later, Paw went home to be with his Jesus. �From that moment, my life changed. �I will always believe that his death was the true beginning of my life. �Watching him die showed me eternity was real. �Where I spent it was up to me. �I decided I wanted Jesus to be my Savior, my Redeemer, my Rock. I like to think I have a little of both of them in me. �I love to feed people. �I love to tell people about Jesus. �Thank you all for taking this little walk down memory lane with me. �I pray you all have a wonderful Christmas and God bless. This is one of the things I have been busy working on. 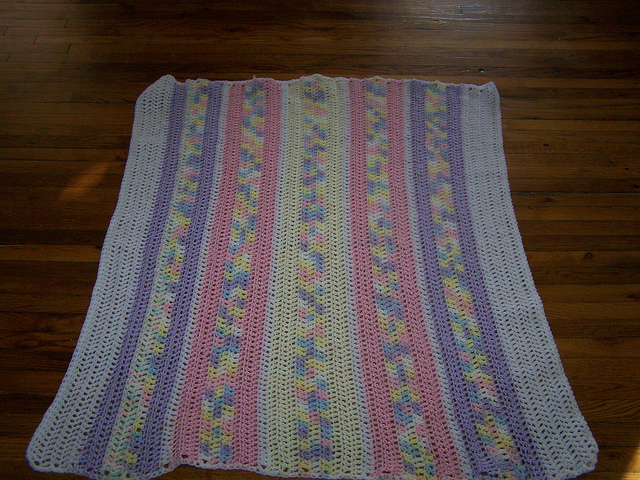 � My friend, Retia’s daughter is expecting a baby girl very soon and I wanted to make her something special from me. �I finally got it finished. �So little Miss Jocelyn, you can come whenever you are ready. We have had beautiful weather here today. �Our temperature is upper 50’s with lots of sunshine. �AMAZING! �I love it. �We had a little snow Tuesday night. �It was pouring down. �Looked like a blizzard but it didn’t last too long. �Just long enough for everything to get a good covering, making it all look beautiful. The youth did their Christmas play Sunday morning at church. �They all did a great job. �I know we are a small church but our plays always seem to be so good. �Everyone seems to put forth a lot of effort to do it and I think it shows in their performance. �I do have some sad news though. �I don’t think I have shared this with you all but Pastor Tom is leaving us. �He said he really feels like the Lord wants him to step down and have someone younger step in as our pastor. �Now I’m not one to try to tell someone what the Lord is speaking to them about but we certainly will miss him and Mrs. Sally. �He says he will stay until the committee finds someone else but it just doesn’t feel the same knowing he will be leaving soon. �The committee has interviewed several people and one is scheduled to preach a trial message on the first Sunday in January. �I would appreciate your prayers for our church on this matter. Well, I think that’s about it. �Enjoy your day and God bless. 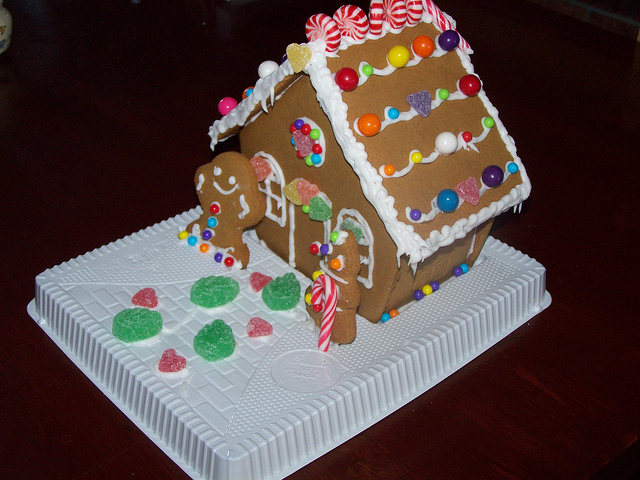 Every year the girls and I try to do a gingerbread house. �I think this years one turned out pretty good. �We buy the kit and then decorate it however we want. Another thing we try to do every year is enjoy this coffee. �It comes from Fresh Market and we LOVE it! �It is (of course) only around at Christmas so that makes it kinda special. �I think I will have to make us some after I finish this post. Grace is finally feeling some better. �She had to go back to the doctor on Monday. �They gave her an inhaler to use here at home and that seems to be helping. �Julie is feeling better as well. �Yeah! We had ice on Sunday so church was cancelled. �The youth were supposed to do their annual Christmas play. �We were kinda glad church was cancelled, that way the girls didn’t miss doing their parts in the play. �Hopefully, we will get to do it this Sunday-depends upon the weather. �Sometimes December is a rough month here. �Today is nice though with sunshine. �The temperature is mild-40 degrees with not much wind. Well, I guess that’s about it. 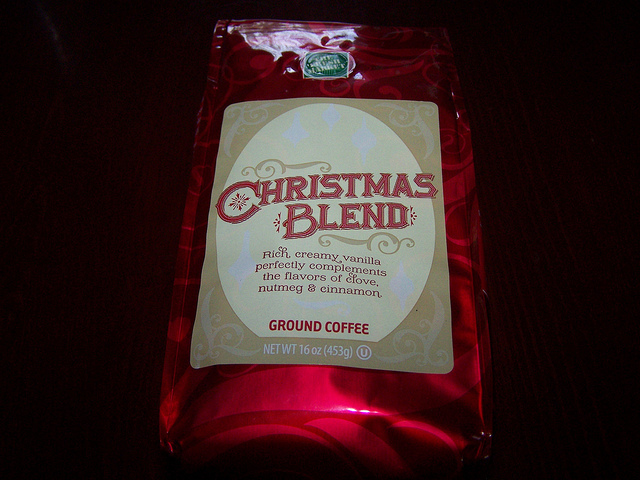 �That Christmas coffee is calling my name. �Enjoy your day and God bless. Hello everyone! �Things have been kinda busy here. �This is one of the things that has been going on. 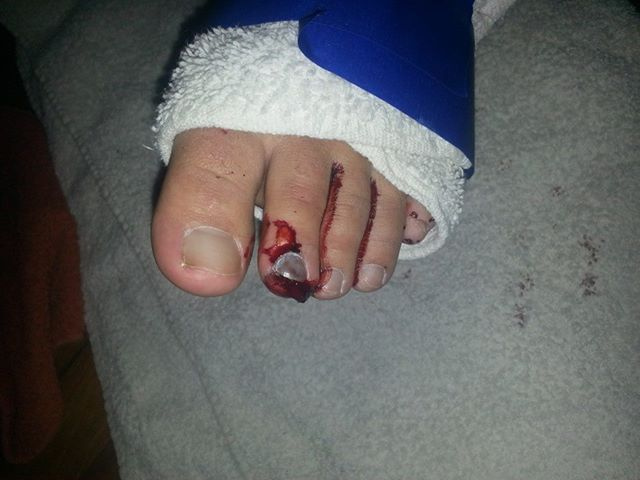 On Monday, Jessica dropped one of the big cans (from Sam’s) of green beans on her toe. �Her toe is broken and as you can tell very smashed. �I went down, spent the night and Tuesday helping her out. �She has definitely been in pain with it. Then on Wednesday, we took Grace to the doctor. �She has bronchitis. �They gave her 3 different medicines so hopefully she will be well soon. �We have a few Christmas decorations up but not many. �We do not do a lot of decorating. �I hope to get the tree up next week but we’ll see. Well, that’s about it. �Oh by the way, Jasper is completely healed. �He has decided though that he really enjoys being inside with us. �He is kinda an inside/outside dog now. �I hope you all have a great week and God bless.